One of the biggest sporting events of our generation captivated a near capacity crowd inside the T-Mobile Arena in Las Vegas along with millions watching at home. Floyd Mayweather defeated Conor McGregor, in a boxing match, at 1:05 of the 10th round via TKO. The significance of this is lost on many but equally realized by others. McGregor won the first three rounds by most scorecards and I also gave him rounds four and five. Mayweather had then downloaded everything he needed to know about McGregor’s unorthodox approach in that pugilistic supercomputer of a brain. “Money” won rounds six, seven, eight and nine before closing the show. McGregor was completely gassed coming out for the tenth round and he got pummeled as he was too tired to throw a single punch. Referee Robert Byrd stopped the fight, which was the right call because, at that point, it was only a matter of time before McGregor hit the canvas. There was no need for further punishment to be inflicted, especially since this was the UFC champ’s pro boxing debut. McGregor deserves a lot of credit for what he accomplished on fight night. He not only did he do better than most people expected but he also did better than most professional boxers have done against Floyd. Several boxing pundits, including ESPN’s Max Kellerman, guaranteed that McGregor wouldn’t land a single clean punch to Mayweather’s face. Well, he landed a clean uppercut to the jaw in round one. 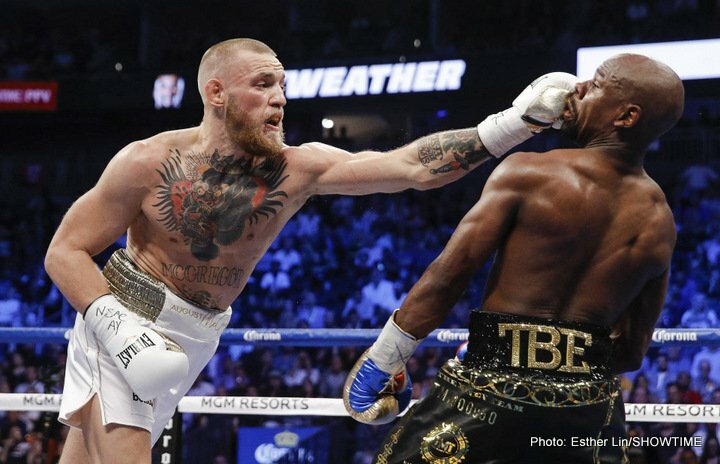 He also hurt Mayweather with a body shot in the ninth round, however, the referee broke it up as McGregor started leaning on Mayweather as his MMA tendencies appeared, which he was admonished throughout the fight. For all the spectacle that this fight was built on, we got more steak than sizzle this past Saturday. In some ways, Floyd Mayweather vs. Conor McGregor is another link on the chain in the evolution of combat sports. The early no holds barred era of the UFC proved which fighting disciplines actually worked in a real combat situation. Over time, the game changed from proving which style was supreme to fighters training in various arts to become the best all-around fighter. Staunch boxing advocates claim that MMA fighters are not on the level of pro boxers. Of course, they look at the combative elements from a boxing perspective, not realizing or ignoring that the way punches are thrown in the cage is different by design. We’ve seen what a high-level pro boxer can do against a high-level UFC fighter in an MMA bout on two occasions with one victory and one defeat. McGregor was the first high-level MMA combatant to step into the squared circle against arguably the best boxer of all-time. Conor landed a lot of punches with little power behind them. They didn’t need to be power shots, however, because it’s all about scoring points, which is how Mayweather fought the majority of his career. Yes, Floyd was coming off a two-year layoff. Yes, Floyd is 40 years old. Yes, McGregor was Floyd’s first KO in almost ten years. Still, he has forgotten more about boxing than most will ever know. Next time someone says an MMA fighter can’t hang in a boxing ring, make sure they know which cage specialist they are referring first. McGregor’s MMA skills translate well into boxing because the sweet science is the foundation of his fighting style. Randy Couture is a UFC legend, however, his wrestling-based fighting style would make him a horrible candidate to square off against Wladimir Klitschko inside the ropes. Floyd Mayweather is now retired at 50 – 0, breaking the record of the great Rocky Marciano. Conor McGregor is now worth his weight in gold and his UFC bouts from this point forward will see new horizons from a media and financial perspective. Fighting is fighting until it isn’t. Then, it’s all about the rules, numbers and where the fight takes place. Just like Bruce Lee and Royce Gracie before, Mayweather and McGregor have evolved not just their respective sports but the fight game as a whole.